My sweet peas have just started flowering this week. So tempted to cut some & bring them indoors, but I'm waiting until there's just a few more! ... but right now I'm on a bit of a mission! My daughter belongs to the local La Leche group and they are fundraising this Sunday with a table at the children's market on Herald Island. I promised a while ago that I'd donate a couple of quilts. 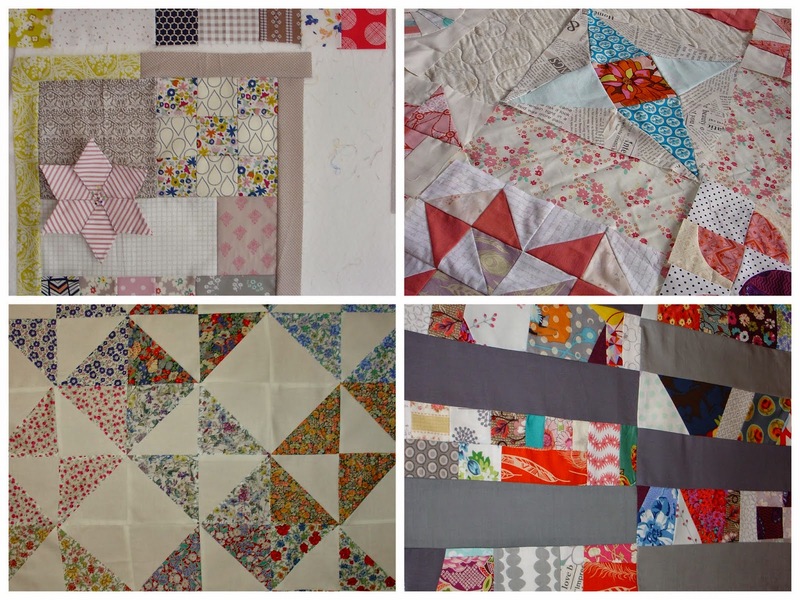 Luckily, I do like to have a few unfinished quilts here, just waiting for a home to go to, including a simple squares quilt which I have made several versions of now. But of course, I've left everything to the very last minute - it's a family trait!- and so I need to get a wriggle on and quickly put the binding on two or maybe three little quilts. Edit ... Whew... two little quilts all finished just in time! Hehe maybe I should work to a deadline more often! 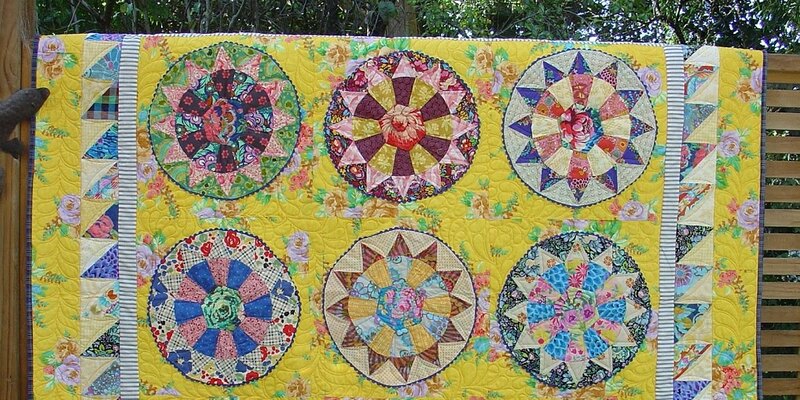 ... actually I love those old worn out quilts just as much as the fresh versions, don't you? 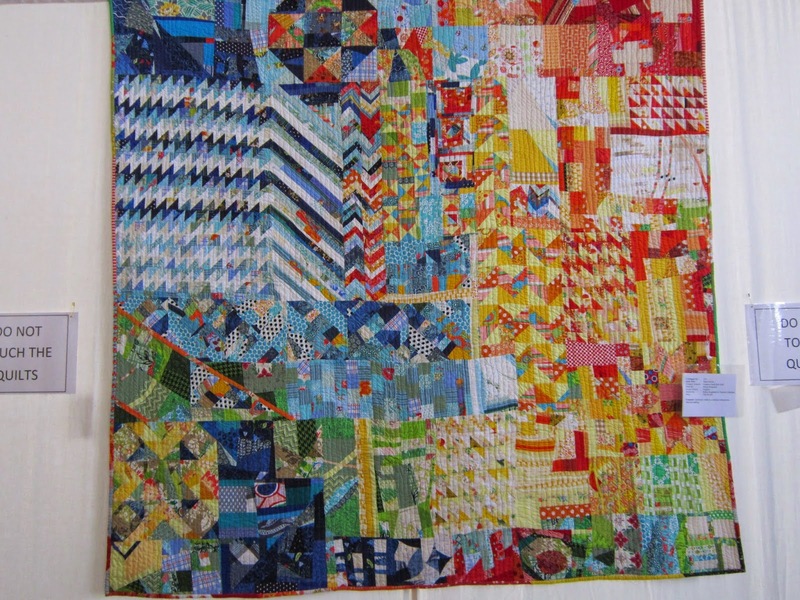 Sampler quilts... I enjoy making the occasional sampler mainly because I have a short attention span and I've found that as each block is different I don't get bored! If several techniques are used, it's also a real good learning process too. And I've liked this particular BOM actually because there is no applique! My initial thought way back at the beginning of the year was to try a more modern makeover version each month, not just do the same-old-same-old... and so I've been brave and used more & more solids as the year has progressed, and while I haven't totally used only one designer range, I have stuck to a limited colour scheme! Since I doubled up on one block earlier, I now have 12 blocks finished and so this weekend I'm at the point of deciding about alternatives to traditional quilt top layouts. Keeping simplicity in mind, I'm using Grunge Basics Essence which, while it does have a slight blue tinge to it, is also an overall neutral light coloured solid. I'm happy for some blocks to merge into the borders, giving a calming effect and creating more -ve space for some quilting! In my mind, the more whiter bits here & there add the sparkle! And definitely a scrappy binding later to add the finishing touch! A couple of blocks have turned out not quite exactly 12 1/2" square, but in the spirit of 'embracing-the-process' of making a hand made quilt, I'm not too worried. There's a bit of wiggle room if I add sashing, so at this point I'm going with the 2nd photo. What do you think... sashing or no sashing? Or then again, maybe I could put them all 'on point' ? oh dear, endless possibilities! 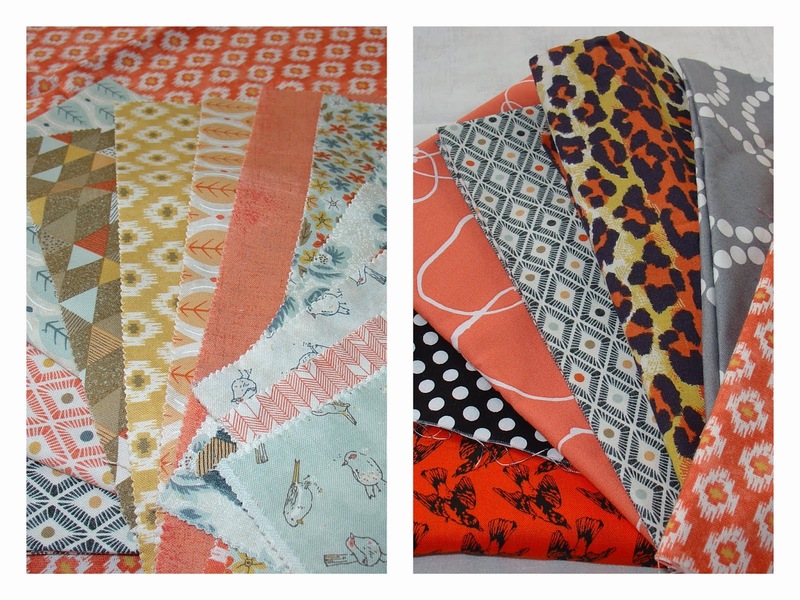 And a rather mellow collection of Persimmon BasicGrey, Moda arrived from Fat quarter Shop. I began mixing things up straight away, not too sure where this is headed yet! We braved the weather, went into town to see "My Old Lady" at the Lido, I think everyone else in Auckland had the same idea!! Finally, the beginnings of a vege garden. My son & daughter-in-law are staying with us for a couple of months until they go over to Melbourne to live. Charlotte came with me to the quilt show this weekend, the Auckland festival of Quilts. 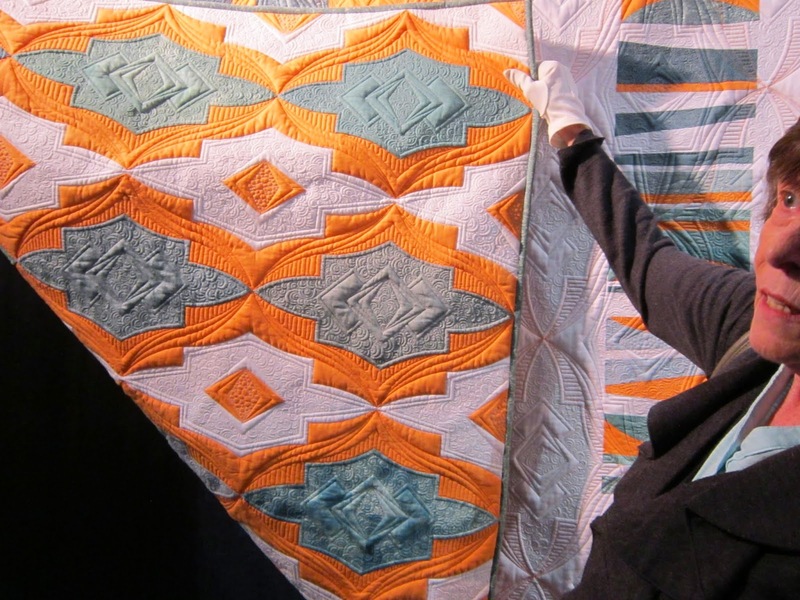 She has just finished her Bachelor in Design, majoring in fashion with honours and it was very interesting to see which quilts caught her eye! My picks for the day were really rather different! I just loved a few of the more old fashioned ones, the workmanship & time to make them was impressive. Oh, and both Charlotte & I were quite impressed with this hands-on-book. She did a bit of a sales job for them while we looked thru' it!! 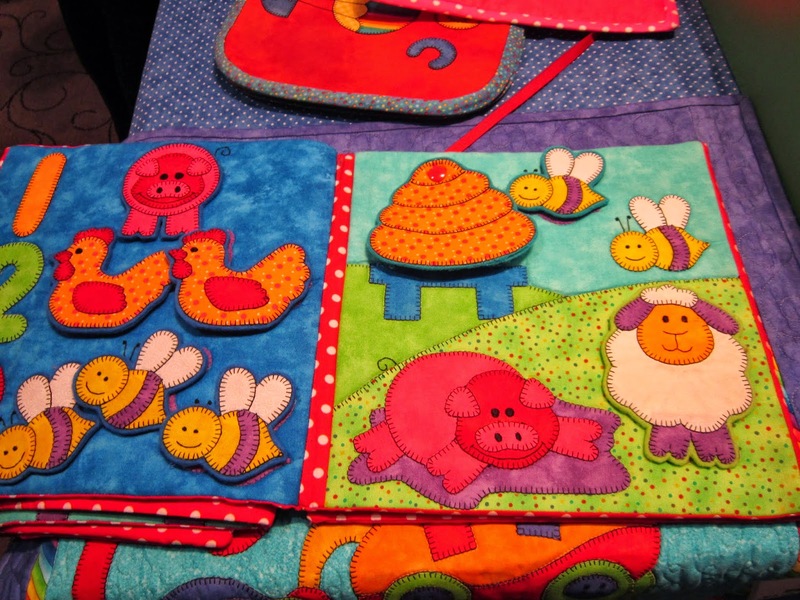 Farmer Joe's Quiet Book, pattern made by Kids Quilts right here in Laingholm. and Charlotte bought the pattern! 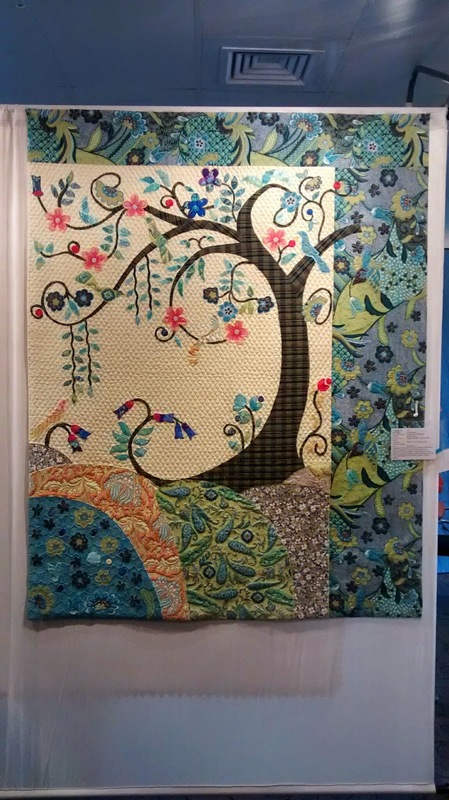 We had a lot of fun together at the quilt show. I shall miss them both heaps when they go - but still it's easy enough to pop-over-the-ditch, isn't it? Well, the next couple of weeks are a bit hectic for me so my priority just now is finishing up a few things. 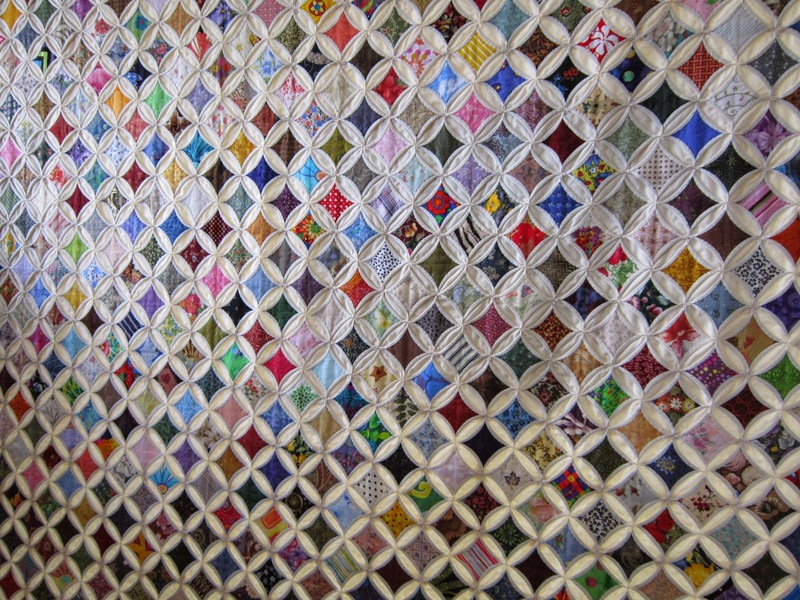 I have a couple of quilts that I want to gift for Xmas but they need quilting first. 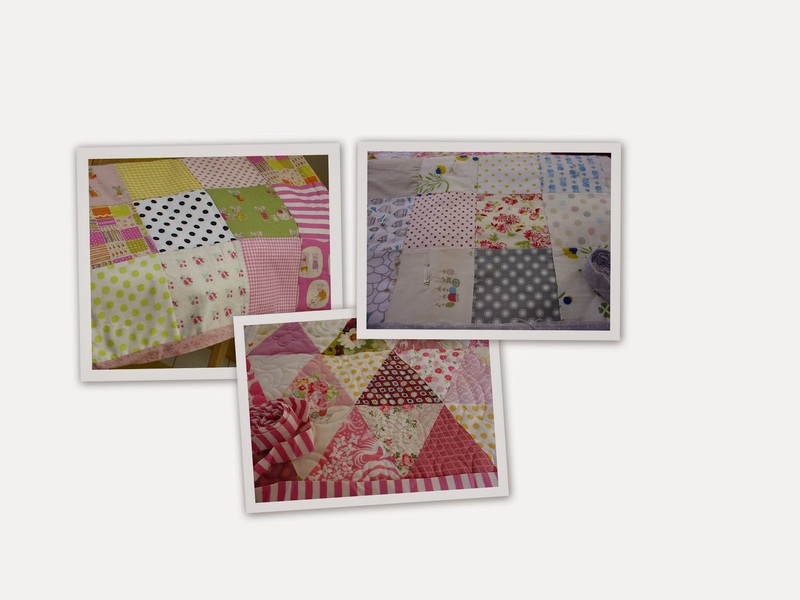 I struggle with FMQ so will opt for simple straight line quilting on both on them. I am a bit of a multi-tasker I must admit, often juggling a few things all at once, so I also have a couple of other WiP's up on my design wall! I am doing two BOM's, Ginger Crush which uses lots of soft muted colours and Classic meets Modern which finishes up next month. 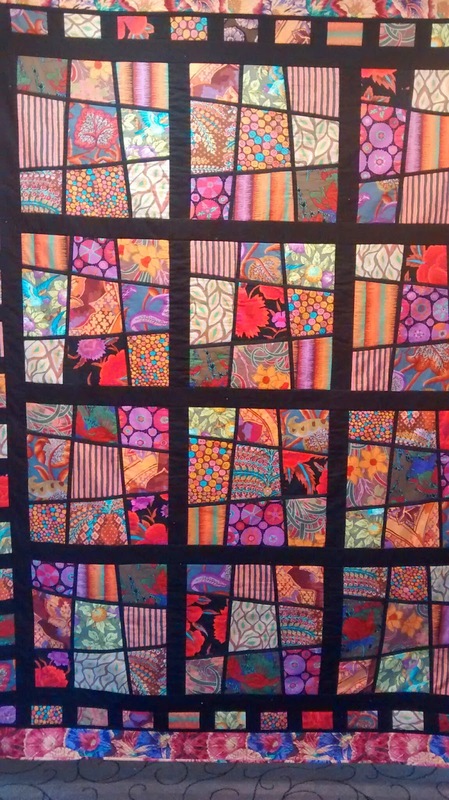 I have just started a new quilt using my lovely Liberties. But I've been held up with any further progress as I am waiting for more Kona cotton to arrive. 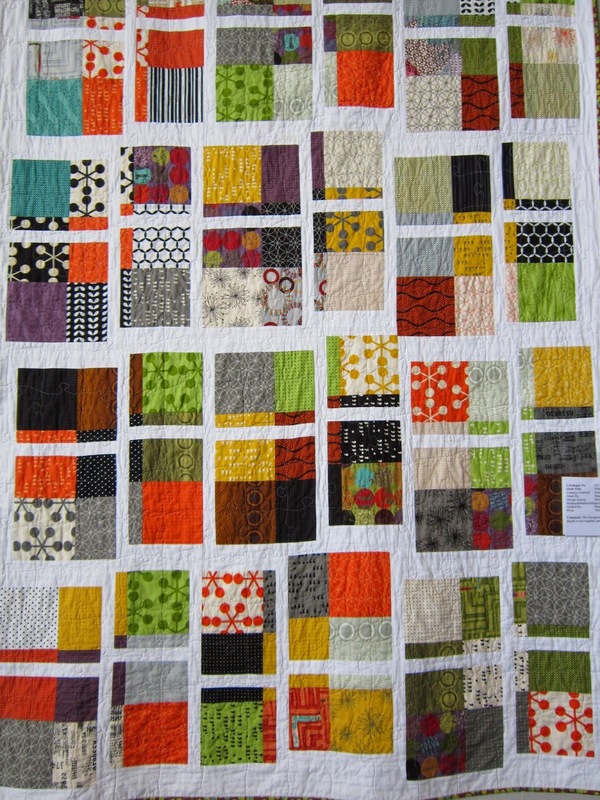 And I have also got one quick piecing fun quilt that I'm making whenever I get a moment to sew. It's a version from Victoria Findlay Wolfe's 15 Minutes of Play book, creating made-fabric from scraps. I should tell you thou' if you do give this a go, it's a lot of fun and it's very addictive sewing! 2. How does my work differ from others of its gene? I haven't, so far, made an "all solid" quilt. And I don't really enjoy using all white as a background, I much prefer mixing assorted creams, whites & greys together from my stash to get an interesting effect. My tastes have definitely changed a little over time, mainly due to all the inspiration that's out there in blogosphere! I feel I'm kinda moving away from the traditional to a sort of happy mixture somewhere inbetween the old & the new! 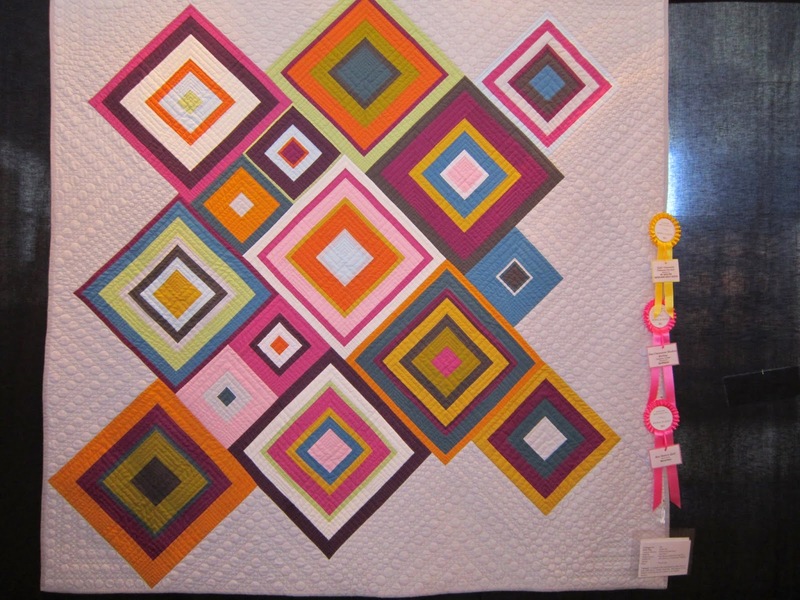 I also belong to a little group of quilters called "Monday Modern." We meet each month and I have found this to be a great source of inspiration and a wonderful way to share & meet like minded quilters. Again I guess like many, I start with either a colour scheme that appeals, or have a particular fabric that I want to use, or maybe a pattern I want to try out. But while I often may have some initial concept in mind, I always seem to end up changing things along the way... sound familiar? 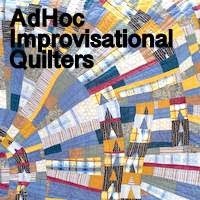 Luckily, I really enjoy the actual processes involved in making a quilt, you know, all that fun of choosing the fabrics, all that trial & error of what works & what doesn't, all that fudging your way thru' new techniques! I do get there in end and usually have a quilt I'm happy with, it just takes a bit of time, which is ok! Thank you Kathy for tagging me and in turn, I am tagging Robyn who also belongs to the Monday Modern group too. 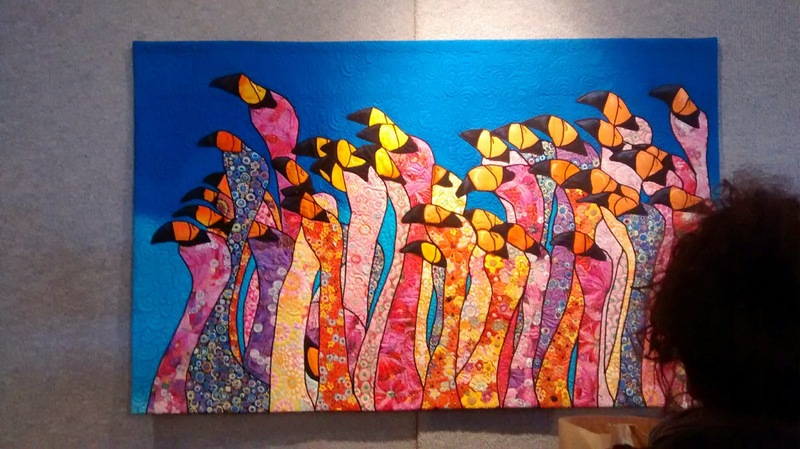 She blogs over here @ http://www.robynie.com/blog/ I love her fresh approach, and you should see all those tiny bits of piecing in her Brain Waves quilt, it really is quite amazing! Pop on over and check it out on her post later on. 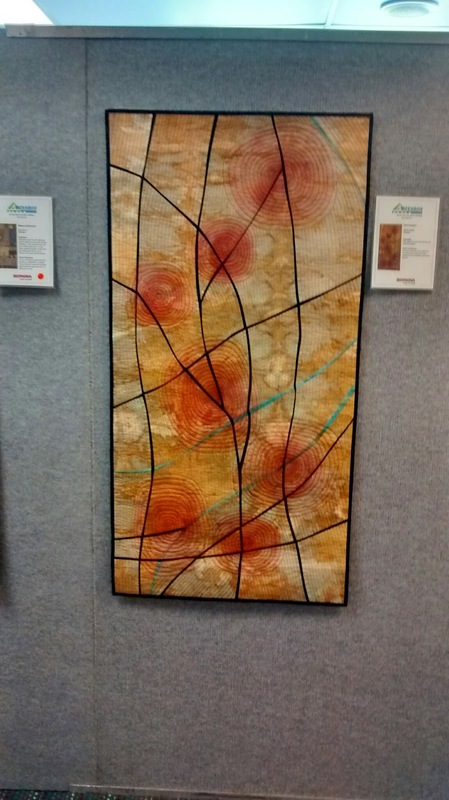 I'm looking forward to seeing the finished Brain Waves quilt in-the-flesh at the quilt show this coming weekend... for those overseas, here in Auckland, NZ we have the huge Festival of Quilts happening, the annual show of the Auckland Quilt Guild. I am also tagging Juliet from http://www.thetartankiwi.com/ I love her unique paper piecing patterns (haven’t as yet got into paper piecing myself!) and her attention to detail is amazing, pop on over sometime to check it out! I woke up this morning and finally made a list of things to sew! After a couple of weeks of not actually sewing I seem to have a lot of new ideas running round in my head! 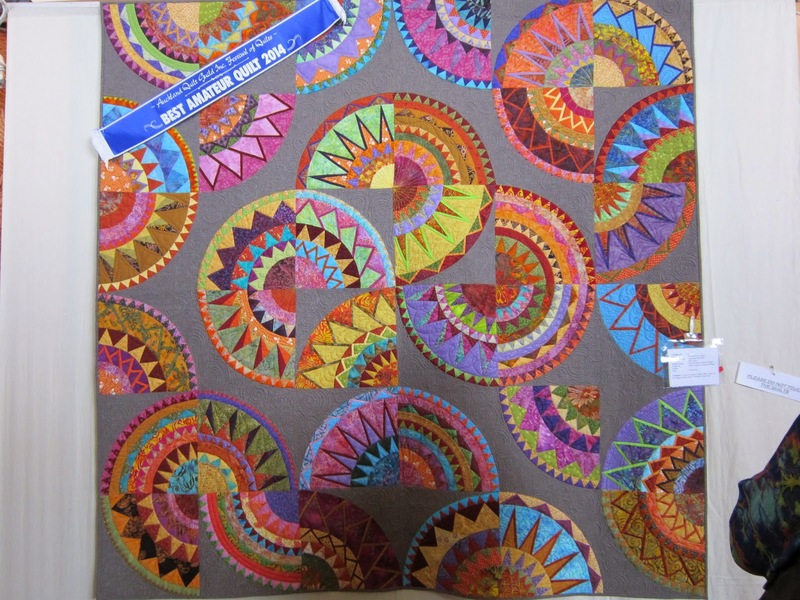 I also have a few almost finished quilt tops lurking around which I want to gift for Xmas so I better get a wriggle on! Time to reassess & prioritise... and to make the list! Do you have lists too? do you find you actually follow them? and do you religiously tick things off as you go? lots of lovely sunshine today! Priority this morning was to finish up making HSTs for my neutral quilt. I rumaged thru' my stash to find as many geometric prints as I could for added interest, and I tried not to over think what-would-go-with-what as I made the HST's! Some combinations have been repeated and I have used one particular yummy fabric quite a bit too-that vogue new trends back to tradition one-just to help with continuity. And like Cheryl, I've also tried to make the value difference in a couple of the blocks quite subtle, where they almost blend right into each other which I think is nice. 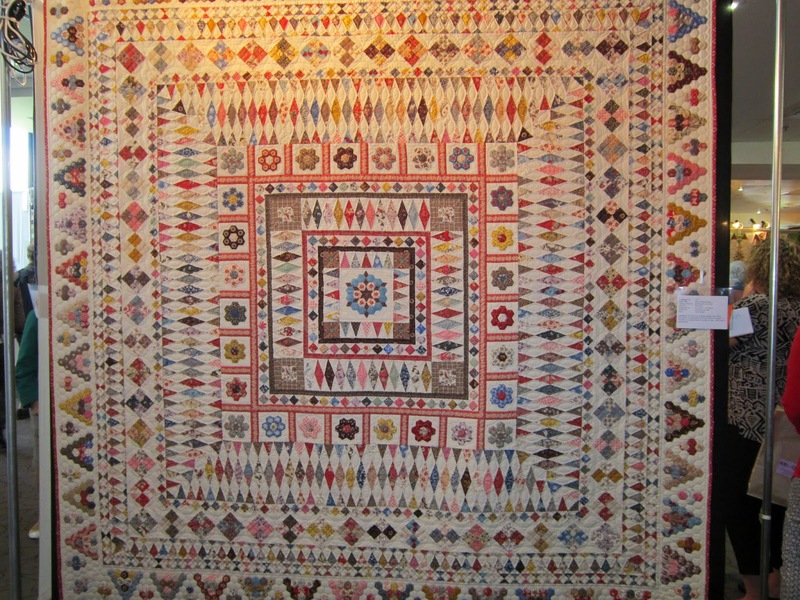 I think this is one quilt that will be very easy to live with... so soft & peaceful!